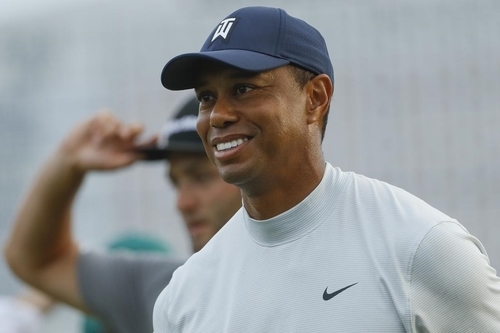 Woods had just played a miraculous approach shot from the trees to the par-4 14th hole, when a member of the Georgia Bureau of Investigation tried to prevent patrons from getting too close to the 14-time major winner. But the guard slipped on Augusta's wet grass and made contact with Woods' ankle. Woods, who has a history of injuries including a torn ACL, limped in pain for several metres but was uninjured. "No, it's all good. Accidents happen," Woods said. "I've had galleries run over me. When you play in front of a lot of people, things happen." Woods jokingly added: "Other than having four knee surgeries and four back surgeries, I'm great." Elsewhere on the course, world No.3 Rory McIlroy hit a drive on the par-5 15th that was so wayward, it flew beyond the trees, over spectators and nestled into a golf buggy being used by an Augusta National official. Thailand's Kiradech Aphibarnat was also made a victim by Augusta's soggy conditions - which forced a 40-minute weather delay - when he lost balance hitting his second shot and fell on his back as his approach found the 17th green, 19 feet from the hole. Aphibarnrat made par on the par-4 17th and finished the round with an even par 72 after scoring an opening-round 69. Former Masters winner Zach Johnson, on the par-5 13th, unintentionally clipped his ball off his tee during a practice swing and it rebounded off the tee marker to land a few feet in front of him. But it wasn't a penalty. Under the new Rules of Golf, a tee ball is only considered in play when a player intends to hit it. Johnson finished the round 1-over 73 to sit three over through two rounds - making the 36-hole cut on the number. Spanish ace Jon Rahm dropped his club and winced immediately after shanking his second shot at the par-5 eighth and it flared into the trees - causing fans to flee and cover their heads.